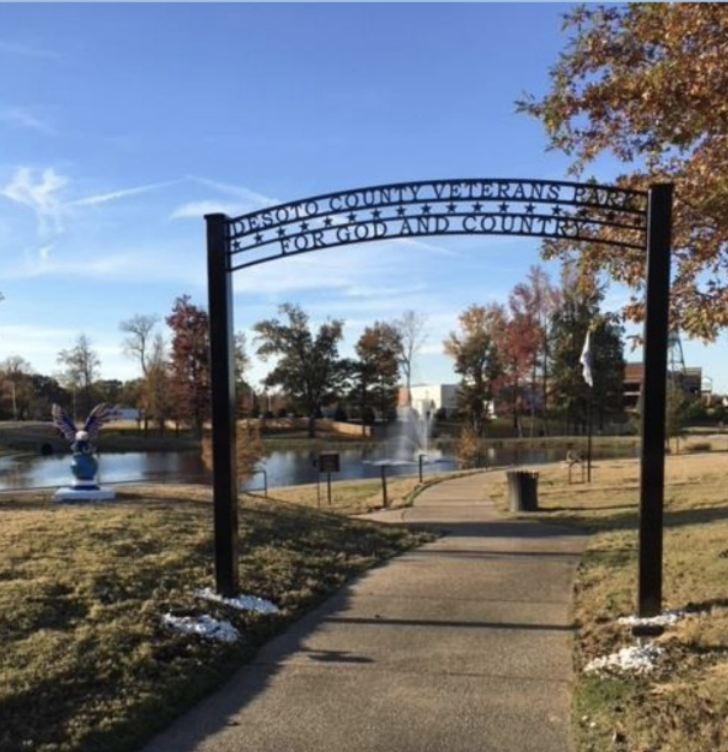 The first Veterans Park to honor ALL our nation’s heroes opened Oct. 7th, 2017 and to our knowledge there is no other park like this in the country. 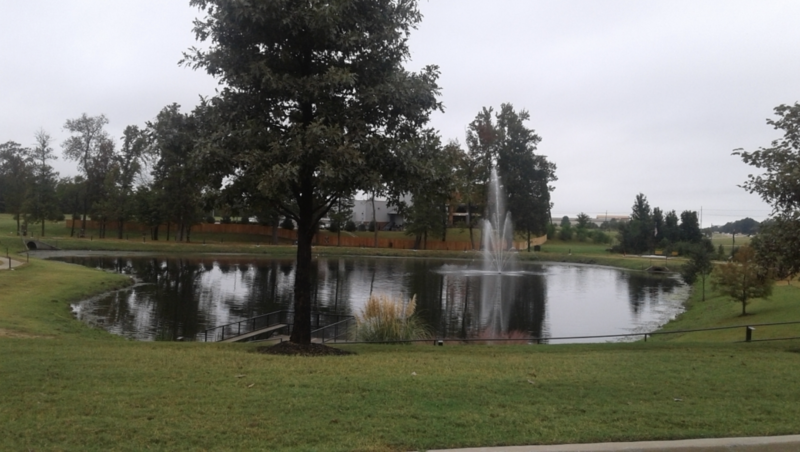 This beautiful park is located just south of Memphis, Tn. 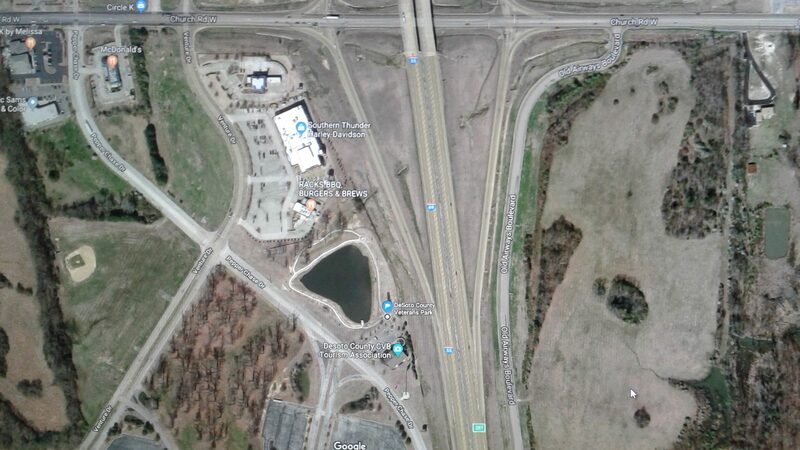 in Southaven, Ms. at I-55 and Church Road, Exit 287, between Southern Thunder Harley Davidson and the DeSoto County Tourism office at 4716 Pepper Chase Drive. 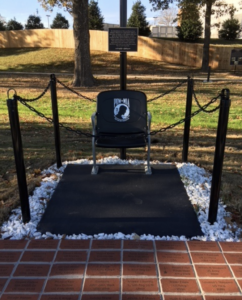 Our park is unique in that it is not just a Memorial Park to honor those who are deceased but a Veterans Park to show our appreciation to the living for their service and even includes picnic tables. We are so proud to be able to honor our most precious citizens and members of the largest family in the world, our Veterans. Imagine walking through the events that shaped our country, to think of that ancestor, that parent, that spouse, that child, that brother, sister, aunt, uncle, or cousin that was part of making our country what it is today. 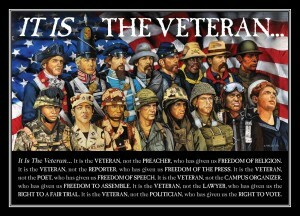 Their sacrifice should not be minimized and cannot be measured, it can only be honored. The park honors ALL U.S. Veterans, beginning with the Revolutionary War to the present War on Terror, including the Middle East and Caribbean Regions Conflicts. 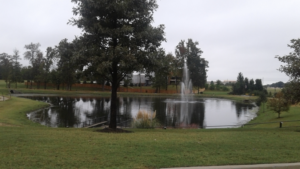 The beautiful bronze plaques are from International Bronze of Fort Myers, FL. 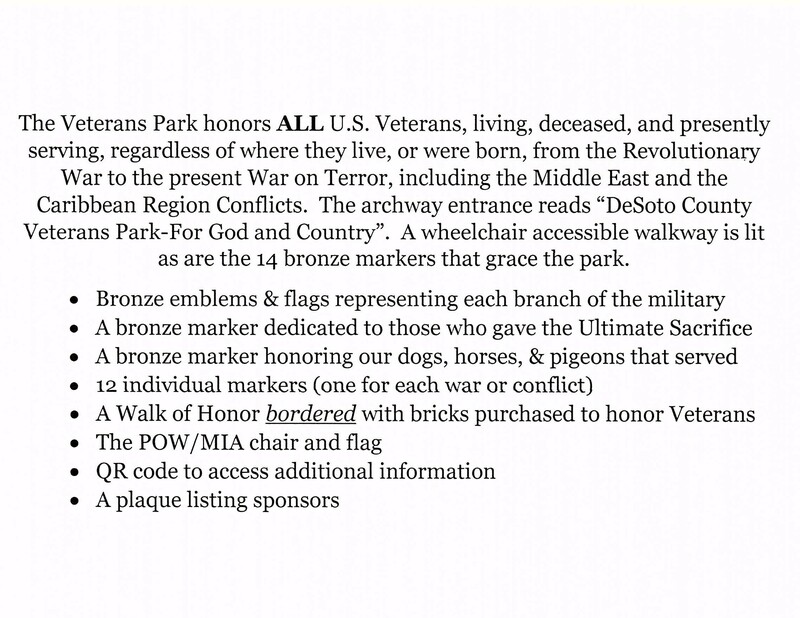 and include a plaque dedicated to those who gave the Ultimate Sacrifice, one to honor our dogs, horses and pigeons as “The Also Served”, 12 individual plaques (one for each war or conflict), 6 emblems and flags representing each branch of the military, a “Walk of Honor”, bordered with bricks (see below) honoring U.S. Veterans, the POW/MIA chair and flag, and a Sponsorship plaque. 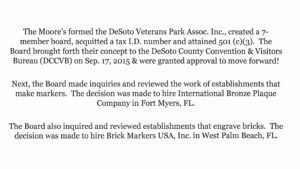 Visit the DeSoto Veterans Park, walk through the history of our country, & honor the Veterans that fought to preserve our freedoms. 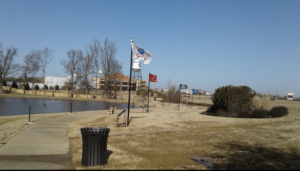 Please look at the “Updates” Tab for the latest information and frequently check in with us on FB @ DeSoto County Veterans Park. 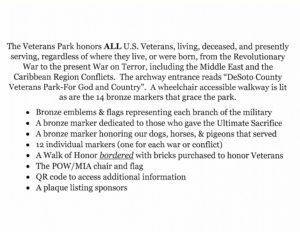 To see pictures of the 14 beautiful bronze plaques that are in the park, use the Preview Tab or: >click here. 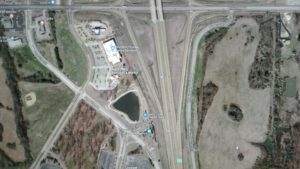 Brick may be purchased to honor any U.S. 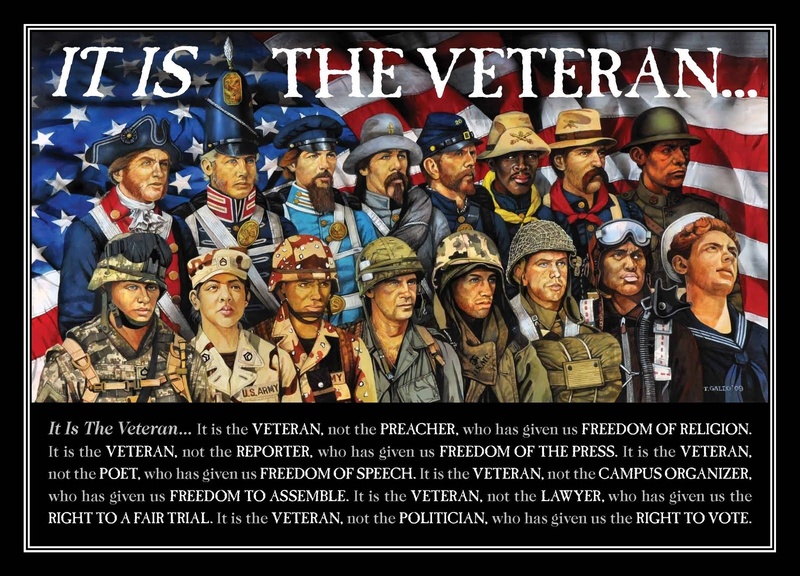 Veteran, both past and presently serving, for any war or conflict or for time served regardless of whether they were in theater or not and regardless of where they were born, lived, or are now living, for $125.00. 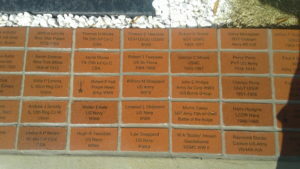 Anyone can purchase bricks but the name on the brick must be a VETERAN. Families will be kept together on the “Walk of Honor”. The one requirement is if there is a reference to a Bronze Star, Silver Star, Purple Heart, or Medal of Honor, the applicant must include a DD-214 to avoid Stolen Honor. These awesome bricks are from Brick Markers of West Palm Beach, FL and are printed with the latest laser machine and border the “Walk of Honor” across the top of the levee at the north end of the park. 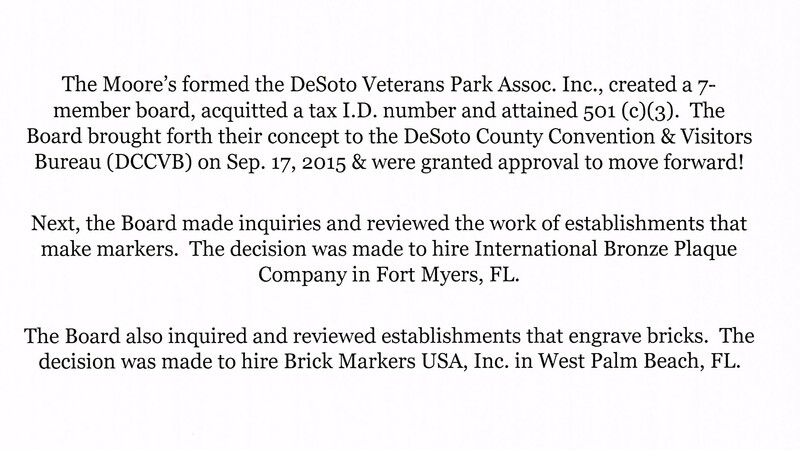 Mail your brick form and your check or money order made payable to DeSoto Veterans Park Association, Inc. and mail to the address on the form. You can also use the PayPal Donation Button and include the Confirmation # on the “Unit Price” line on the brick form and mail to the same address or email the form to dmoore1776@aol.com. We receive an email from PayPal and can confirm your order with the Confirmation # on the PayPal notification. Click here to download the purchase order. For information on SPONSORSHIP, please click here.